The United Nations General Assemble proclaimed 2019 as the "International Year of the Periodic Table of Chemical Elements," commemorating the 150th anniversary of the establishment of the Periodic Table of Chemical Elements by Dimitri Mendeleev. The International Year aims to recognize the importance of the Periodic Table of Chemical Elements as one of the most important and influential achievements in modern science reflecting the essence not only of chemistry, but also of physics, biology and other basic sciences disciplines. 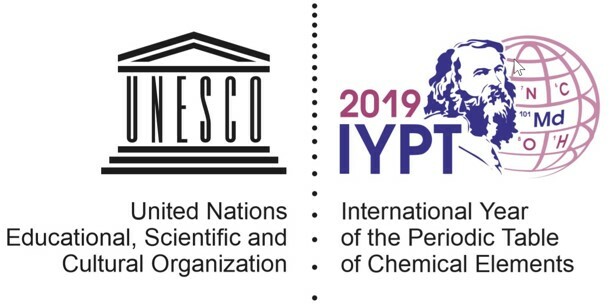 The IYPT 2019 official website is https://www.iypt2019.org. The Reciprocal Net is a distributed database used by research crystallographers to store information about molecular structures; much of the data is available to the general public. The Reciprocal Net project is still under development. Currently, we have 18 participating crystallography laboratories online. The project is funded by the National Science Foundation (NSF) and part of the National Science Digital Library. More about Reciprocal Net. American Crystallographice Association annual meeting. "Is a bent crystal still a single crystal?" Patrick Commins, Durga Prasad Karothu, and Pance Naumov. "Imbact of Disordered Guest-Framework Interactions on the Crystallography of Metal-Organic Frameworks." Seungkyu Lee, Hans-Beat Bürgi, Sultan A. Alshmimri, and Omar M. Yaghi. Mohamed I. Hashim, Ha T. M. Le, Teng-Hao Chen, Yu-Sheng Chen, Olafs Daugulis, Chia-Wei Hsu, Allan J. Jacobson, Watchareeya Kaveevivitchai, Xiao Liang, Tatyana Makarenko, Ognjen . Miljani, Ilja Popovs, Hung Vu Tran, Xiqu Wang, Chia-Hua Wu, and Judy I. Wu.